The global objective of this research was determining the relations between anthropometric variables with success in judo bout. The research was conducted on a sample of 122 subjects. The sample of variables consisted of 18 anthropometric measures, out of which three latent dimensions were isolated by the use of factor analysis. Three latent dimensions (factors) represent a set of predictive variables. Criterion is defined as a success in judo bout and it is represented by two criteria variables; number of wins and technical efficiency in judo bout. To test the relations of latent anthropometric variables with success in the bout the regression analysis was used. Statistically significant but low connections were found between anthropometric variables and the two criteria. As only the factor volume and mass of the body partially contribute to the explanation of criteria, one can conclude that the active muscle mass is in the background of achieved connection. 1. 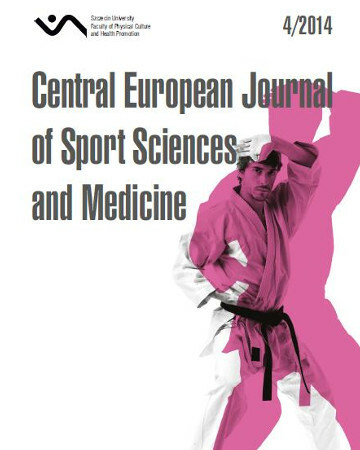 Almansba R., Franchini E., Sterkowicz S., Imamura R.T., Calmet M., Ahmaidi S. A comparative study of speed expressed by the number of throws between heavier and lighter categories in judo. Science and Sports. 2008; 23 (3–4): 186–188. 2. Franchini E., Sterkowicz S., Meira C.M., Gomes F.R., Tani G. Technical variation in a sample of high level judo players. Percept Motor Skills. 2008; 106 (3): 859–869. 3. IJF Refree Rules (2014), www.ijf.org. 4. Kuleš B. Judo. Sportska tribina. Zagreb 1990. 5. Kuleš B. Utjecaj antropometrijskih varijabli na rezultat u judo borbi u apsolutnoj kategoriji kod žena [Influence of anthropometric characteristics on judo match in “open weight” category for women]. Kineziologija. 1996; 28 (1): 54–57. 6. Medved R., Janković S., Ivanek M., Javornik N. Morfološke osobitosti studenata kineziologije [Morphological characteristics of students of faculty of Kinesiology]. Hrvatski športskomedicinski Vjesnik. 1992a; 7 (3): 54–57. 7. Mišigoj-Duraković M. Morfološka antropometrija u športu [Morphological anthropometry in sport]. Fakultet za fizičku kulturu Sveučilišta u Zagrebu. Zagreb 1995. 9. Sertić H. Povezanost koordinacije s uspjehom i efikasnošću u judo borbi jedanaestgodišnjaka [Connection of coordination and efficiency and success in judo match in 11 years old children]. Hrvatski športskomedicinski Vjesnik. 1997; 12 (2–3): 70–75.